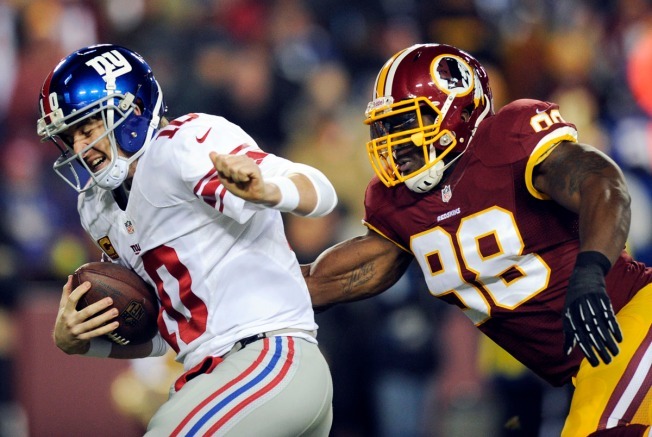 Giants quarterback Eli Manning, left, is sacked by Washington Redskins outside linebacker Brian Orakpo (98) during the first half of an NFL football game Sunday. Redskins linebacker Brian Orakpo suffered a strained right groin muscle in the Sunday’s 24-23 loss to the Dallas Cowboys. While battling Cowboys tackle Tyron Smith, Orakpo was seen forcefully changing directions and later hit the ground reaching for his upper thigh. Most athletes know what the injury is before they even seek medical attention. The groin muscles, called the "adductor muscle" group, consists of six muscles that span the distance from the inner pelvis to the inner part of the femur (thigh bone). These muscles pull the legs together, and also help with other movements of the hip joint. A muscle strain can be graded according to the amount of muscle damage from 1 to 3. Given the mechanism of injury, it's likely that Orakpo suffered a Grade 1 or partial tear of a few muscle fibers. When this occurs, the muscle is tender and painful, but maintains its normal strength. Use of the leg is not impaired, and walking is normal. Recovery from a Grade 1 groin strain can be 2 to 3 weeks. Orakpo did not return to the game after the injury and will be evaluated over the next few days to further assess his condition. Orakpo did not appear to be limping after the game and declined to speak to reporters before walking out of the locker room. It will be interesting to see if he suits up at all this weekend when the Redskins travel to face the New York Giants. There is little at stake for either team and my guess is Orakpo's season is over. Returning to play too soon could exacerbate the injury and possibly cause more damage for the unrestricted free agent.